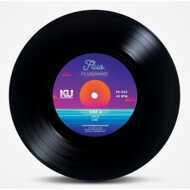 Flughand and and Smuv, 37 and 27 year old producers from Germany, collaborate on their debut EP “Fluo”. They are both giants in the streaming game and known for their laid back, dreamy, lofi hip hop beats. They are two of the most well-known artists in the genre of lofi, with streams counting more than 100 million clicks. BeatPete, a fellow German and widely respected DJ, is the link here for the release on KingUnderground. BeatPete is a friend of KU owner, Dan Englander, since they met on a tour in Berlin in 2015. BeatPete sent links to some music he was enthusiastic about to Dan and then KingUnderground reached out to Flug & Smuv. The two had never met but were fans of each other. From there it was quite straightforward. They have like-minded inspirations in music and they follow the same ethos: music is for fun, not a consumable; any money they make from being creative is a reward. They each have their own distinctive style of cover art for all their solo projects and this time they worked with an Italian artist, “Heey Studio Design” for the “Fluo” EP illustration. It conveys the two of them, a cat (Smuv) sitting on a little island, chilling with a cocktail in the middle of an ocean and a dog (Flughand), flying an airplane up in the sky.